We made it! While this has not been the worst Winter by far (and may in fact go down as one of the mildest)we nonetheless have endured the Winter and made it through the other side. Despite the lack of snow shoveling this year there were cold(ish) temperatures and the grayness that seems to take over everything outside. That should soon begin to change as temperatures start to rise and stay, and the green grass and foliage makes its return. While everyone knows today doesn't mark the actual first day of Spring, it does mark the turning point, the harbinger, the sign post that the actual first day of Spring is imminent. It marks the celebration of Spring. So let's say good-bye to Winter, good-bye to February, and hello to March. Hello to Spring. In case you've been pulling a Rip Van Winkle (and how cool would that be really?) let us be the first to inform you that Summer has come and gone. While it was hot and dry in the Eastern US it nonetheless was quite enjoyable. The lack of rain made things difficult for farmers and the water tables no doubt suffer from it but it made events easy to plan and execute. Picnics, beach days and outside fun were in huge abundance. But all that's changing now. Just a week ago we were in the hot and humid 90s and suddenly we're plunging into the 60s as the high for the day. Nights of course dip deeper, prompting windows to be shut and long sleeves to be re-discovered and worn. Feels cozy but different after all of Summer's humidity. So today the Fall equinox occurred and brought the first day of Autumn, otherwise known as Fall. We welcomed it in at 4:22AM EST although many of us doubtless slept through it. Kudos to you if you were still partying or arising to start your day. It's time to enjoy the crisp air, bid adieu to the humidity and anticipate the changing of the leaves and the local color. It's a beautiful time of the year, full of constant change. This year we'll be treated to a total lunar eclipse of a super moon, which is extremely rare. The last one ocurred in 1982, the next will be 2033. Check out when the eclipse is active in your location. Today I woke up, realized the month had ended and re-arranged my desk calendar. Friends and regular readers of this site know full well how the changing of the months matters to me. Flipping the calendar seems to convey some importance beyond the mere act; it's as if each new month heralds a transition, something new, often a change in one's personal ecosystem or viewpoint. I had meant to write about this yesterday, which of course was the last day of August. But it's actually better today on the first day of a new month. Because a transition is indeed in the air. For today is September 1. I've written in the past about the melancholy surrounding the passing of summer. Such drama seems to have relaxed a bit but it still rings true even if the edge has been dulled somewhat. There is a certain sadness which settles in when we realize that for the most part Summer is over. We made it to May and celebrated Memorial Day, the unofficial start of Summer. We enjoyed the heating up of the atmosphere in June, the parades and fireworks on July 4, and swam and biked and socialized all the way through the end of August. Did I just say the end of August? Yes. It occurs almost without warning but each year we have notice of what's happening but don't pay attention. The truth is August is a slippery beast. It signals that for the most part Summer is half over. Most don't give it any more than a cursory nod. The parties and fun times continue unabated through July into August without a care in the world. "August already?" some say on their way to a friends house, the movies, or the beach. And then they turn around and it's already August 10. Which quickly accelerates to August 15 and beyond. At this point there's only two weeks left, the end is suddenly well in view and where did it come from? People start to batten down the hatches, prioritize their time more stringently and prepare for the shift back to normalcy. Kids back to school, vacation time over, the whole lot. Television commercials advertise Labor Day and Back to School deals although truthfully these seem to start earlier and earlier each year. This year the back to school sales appeared in July which seemed awfully cruel. So we've done it; we've enjoyed the Summer and it's all happened again. Last night just before midnight we squeezed the last drop out of August and a minute later everything shifted to September. The good news then is this: we still have the last Summer holiday of Labor Day before we shut this whole operation down. Do not let it go easily. Make sure you do something fun and send this Summer out with the respect it deserves. Treat it like a friend moving away and send him off in style. Party until dawn, take some bicycle rides, have a barbecue, do some kayaking. Just do it. Leave nothing in the tank. You'll respect yourself later on for riding this Summer all the way home. And of course there is this: Summer doesn't technically end until September 23. But by then everyone is into their normal routine again, not to be disrupted again until next May. I've been thinking a lot about us. I'm afraid this just isn't going to work out. Your cold. So very cold. When you blow into town everything stops. It's like a state of emergency. To keep the peace, there's things that must be done. You've literally kept me busy for 3 months straight. You've cost me money. You've cost my friends money. You have no regard for safety. I've cancelled plans for you. You've made me cancel those plans when you decided to show your anger. For these and other reasons I'm breaking up with you Winter. All the best. Maybe we'll run into each other in the future. Aah, March 1. That date when we can finally see the light at the end of the tunnel. While we're not completely out of the woods yet, the end is near everyone. The end is near. This year Winter wasn't confined simply to the Northeast and it's neighbors; no, this Winter reached as far south as Georgia and Tennessee, dumping multiple inches among multiple storms during its reign. Picking up speed as it went east, it then managed to continuously clobber Boston and New York with no mercy. Even today, the slap in the face is that there's another storm coming tonight, on our most revered of holidays as we celebrate Winters end. The nerve! One to three inches isn't much compared to what we've all been through but let's just hope it's one of the last storms we have to endure. Or let's just make a pact right now: we'll put up with this one and THEN WE'RE DONE. Fair? To everyone who's endured, and that's been a fair amount of the country at this point, I say good job. You've earned a 9 month break. Let the sun shine, the temperatures warm, and all that snow turn into water and fill our swimming pools. Instead of snow shoveling let's get out the bikes and ride all day. It's time for Spring to finally make it's appearance. By now most of you are familiar with the concept of Victo Spring. Amazing to me is that as the word spreads about this people not only like it but embrace it for themselves. Last year we even saw television weather people using a variation of it they called "meteorological spring". Basically a smoke screen for the fact that February is over and now we're in March which is the herald of Spring, which is exactly how Victo Spring was born. There is an annual Victo Spring celebration dinner which I never would have imagined anyone attending years ago. Now people look forward to it and even remind me. "Where's this year's dinner?" is a common opener. Now something new has come to light and it's not from me but rather a family member. It's called the Three Week Mark. Simply put: it's the line you draw on the calendar that within three weeks of that date Winter and all it's associated storms will cease. No more after that date. Nada. Some practitioners add caveats such as "no major storms, maybe some dustings" or "nothing over 4 inches". But most people familiar with this game keep it lean and simple: no snow 3 weeks after the chosen date. Try it and keep a record of how correct you are over the years. Oh, and by the way, only 4 days left until Victo Spring! What a hard cold Winter it has been. The first few days back to work after the Holidays are the worst all year. Why? It’s all about the Holidays themselves. It may seem cliche, but I believe it's true: the holidays are special. There's something different in the air. People are friendlier, there's a feeling of goodwill, and there's lots of festivities. You see it everywhere. The decorations help, and seem ubiquitous: in the workplace, on the city streets, in most homes. You look around and can't help but know that this time of year stands apart from all the rest. The amount of event invitations skyrockets. Friends have house parties, companies have office parties, and there's always impromptu events that just seem to happen such as shopping meet-ups and coffee with friends we haven't seen in months. People reach out, connect and seek out the company of old friends. Our social commitments ratchet up like no other time in the year. There's something in the air. It's the Holiday season. It doesn't matter if you celebrate Christmas, Hanukkah, Kwanzaa or something else. If you're walking around during the month of December you instantly know it's there. It's a tangible presence. It's in the decorations, in the clothes, in the familiar red kettle volunteers, and even in the air. You could time travel from a different month and year and instantly know that you landed in December. In addition to being something you see it's something you feel. It gets inside of you; fills you with end of year reflection, a quiet meditative state combined with bursts of revelry and a desire to reconnect with loved ones. All of which occurs if you're lucky enough and make it happen. It's truly a magical time. Which is precisely why it's so hard to give it up. Many people take a few days off around the holiday season. For those that celebrate Christmas it's Christmas Day, perhaps the day after and Christmas Eve. However, lots of folks are even luckier: they save up most of their vacation all year just for this end of year hurrah. They take the entire time from Christmas Eve to New Years Day off, and some even squeeze in extra days, starting as far back as December 19. And this is why the first two days are the hardest of the whole year. It's because we've had this time off. We've connected with loved ones, with friends. We've given and received gifts. We've laughed hard, partied on, eaten and drank well, and didn't worry about our normal day to day routine at all. It's as if it didn't exist. For those two weeks things were as they should be: focused on fun, spending time with family. By the time we come back from this extended vacation we've been out for multiple days, maybe weeks. We're relaxed, we've had an abundance of fun and we think, "why isn't the rest of the year like this?". But alas, it does end. And when we do come back the real world comes crashing in hard. And it stands in such stark contrast to the Holiday celebrations that it can be jarring. We're expected to step back into our normal responsibilities with our deadlines and commitments. It can be tough, like peering into another person's mindset. And that time is now. New Year's Day was Thursday, which generally signals the end of the Holiday season. This week the normal routine kicks back in. So to all suffering through this re-adjustment period know that others feel your pain. The allure of the Holidays is strong. And for those that need some additional comfort, know that this is a new year with a new Christmas somewhere down the road. It's far down that road, but comforting to know it's there. It's only been 3 ½ weeks since July 4 and yet it almost couldn't feel further away. It feels like the summer sun's been beating down for ages now, like we've been mowing the lawn incessantly, like the summer parties have been playing havoc with our responsibilities for months already, forcing us to juggle what we want to do with what we need to do. And yet, July 4 was only 25 days ago. A shade over 3 weeks. This is the slippery slope of the summer; when you think you've got all the time in the world and summer's just getting into full swing when you realize that the time is actually waning and the end is near. Make no mistake: there's still time left. Lots of it in fact. However, it's July 29, and in three more days it will be August. Then the countdown begins in earnest: you've burned through the end of May (Happy Memorial Day! ), all of June (Father's Day! Summer's here! ), and then July (Happy 4th!) without a care in the world. August usually arrives as a head-scratching, "What the..." type of event where we suddenly realize where we are in time and space and realize it's August, the unofficial last month of summer, or at least summer vacation. It all happens in the blink of an eye. Weekdays spent working, commuting, planning, worrying, and going about your daily business. Weekends spent on the lawn, on the bicycle, at the park and at parties. It's a blissful duality you don't truly find any other time. So looking back it's been a pretty great 3 ½ weeks so far. How has yours been, and what will you do with the next 4 weeks? You never know what you're going to find in Amazon's forums. Usually I forget they exist instead merely reading up on an item's description and reviewer comments. But there are Amazon forums that exist outside of specific products and a chance browsing flyby today yielded a gold nugget. Check it out for yourself: KFC Asked My Wife to Leave. A nice article from USA Today about the summer solstice, which occurs tomorrow at 6:51am EDT. Say Hello to Summer! Let's face it. At no time in recent years has it been more true than now: we've had a LONG hard winter. There's been tons of snow and to call the temperatures frigid is an understatement. Across most of the US northeast normal temperatures have started in the single digits every morning and climbed only into the mid 20s. Even southern states which are normally unscathed have been affected, as snow has fallen many times in places like Atlanta Georgia, well over the Mason/Dixon line. It's as if old man winter wanted to take out his rage on everyone this year and not even the northern/southern boundaries could stop him. Things looked quite bleak back in December as storms and cold weather started to occur with more frequency. We were at the beginning of this thing called Winter, unsure how it would play out this year: mild or harsh. The answer was uncharacteristically harsh. And looking at the calendar and realizing that we had months to go only made it seem worse. Enduring one or two storms was acceptable. But 3 more months of it? That was the real issue. The long game. This year Winter has dragged on, as the snow and temperatures kept falling, dragging our moods down with it. But there is finally something to be hopeful about. We're no longer at the beginning of this. We're near the end. We've endured December, enjoying the Holidays even as the storm season picked up. We've ushered in the new year and made it through January as temperatures plummeted. We've limped into February and finally made it through. Now the calendar has been flipped one more time and we're finally into March. Now things are different. The concept of Victo Spring means there is a light at the end of the tunnel. That we've flipped the calendar to a whole new month and can look forward to a new season's imminent arrival: Spring. Victo Spring is the harbinger of that season; like a mountaintop herald playing his trumpet sending the message, "Spring is coming! Stay strong!". Victo Spring is the extra push we need to make it through the homestretch; to wait for the winter weather to finally break and for the warm weather to finally make it's appearance. The arrival of Victo Spring sends the message: It's Not Long Now. And this year there is a new wrinkle: the mainstream media is embracing it. Apparently everyone else in the world is coming around to the idea of March 1 as the "unofficial" start of Spring. Most of them are calling it the "meteorological spring", to differentiate between the weather-related season of Spring and the astrological Spring, also known as the spring equinox which occurs March 20 or 21 depending on the year. The Big Debate! When Does Spring Officially Start? But we all know where all this started, don't we? With me, and posted here first, years ago. But in the end it's all good. March 1 has always seemed like the arrival of Spring and although it's been a long time since I originally started vocalizing that thought, and came up with the Victo Spring concept, the payoff is now as it finally gains acceptance by everyone. It's all over the place: March 1 IS the arrival of Spring. 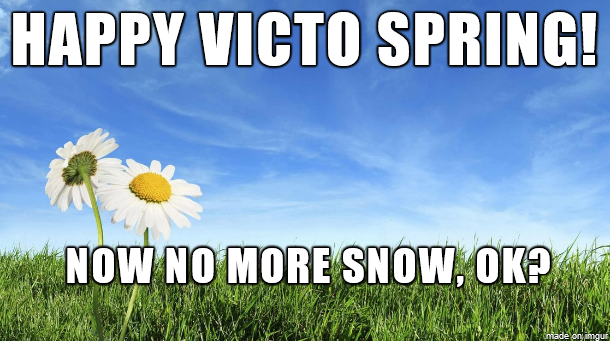 With that in mind: Happy Victo Spring! And may the weather where you are finally start the long warm-up process soon. The iPhone 5C may have shattered a record, but it's hardly one that's likely to make the folks at Cupertino happy. While most iPhones stay at full price until the next version is available, or gradually reduce in price over many months (originally years) the 5C has the distinction of being the fastest-reduced iPhone ever. Repeat: ever. As evidence: the iPhone 5C was introduced at $99 and immediately reduced to $79 by retailers. As if that wasn't head-scratching enough now WalMart is taking it one step further: reducing it to $45 for the Holiday rush. Other retailers such as Best Buy, Radio Shack and Target are all followiing suit with price programs and reductions of their own. Amidst all the talk about the iPhone 5C NOT being the low-cost iPhone we were expecting, I posit that maybe it is after all. Honey, is that a Dragon in the Water? Lots of things wash ashore at beaches but I trust nothing ever like this. This could put some fire back into the old discussion over whether dragons really did (do?) exist. Note: Yes, there are Komodo dragons in the world. This may be a whole different beast entirely. You never know what you're going to see in New York City and Grand Central Terminal is arguably one of its hubs where anything can happen. Today a young man positioned himself at one of the most used exits, the Biltmore Room which exits to 43rd street, and handed our slips of paper to any takers While New Yorkers are used to seeing and receiving flyers for restaurants, sales and other things handed to them, this was a bit different. Each piece of paper had his resume on it and this was a kind of viral marketing tactic to find himself a job. While I didn't get a picture of him I did grab his resume and am posting it to help spread the word. Disclaimer: I don't know him & I can't vouch for him, but it took inventiveness and guts to come up with this and do it. I figured that alone merits the post. Yes, this movie is happening and if they're wise they should definitely grab plot points from Frank Miller's The Dark Knight Returns. An older, darker, grouchier Batman against a morally weakened, puppetized man of steel? That would be great, at least in concept. DC has a history of ruining their movies, and their Superman track record isn't great either, but I give this high hopes for succeeding. The comics are fan favorites and the movie should do well. Looking forward to hearing more about this.